I’ve spent the last three years testing socks and for me this is my go to sock for all but the coldest conditions. Having worked outside for majority of my working life I have a high tolerance to cold and as such don’t really want a sock that causes my feet to overheat creating sweating and along with, it blisters. This sock has the padding where its needed (on the base, toes and heel) and a lighter weight panel on the top of the foot that allows the sock to breathe. 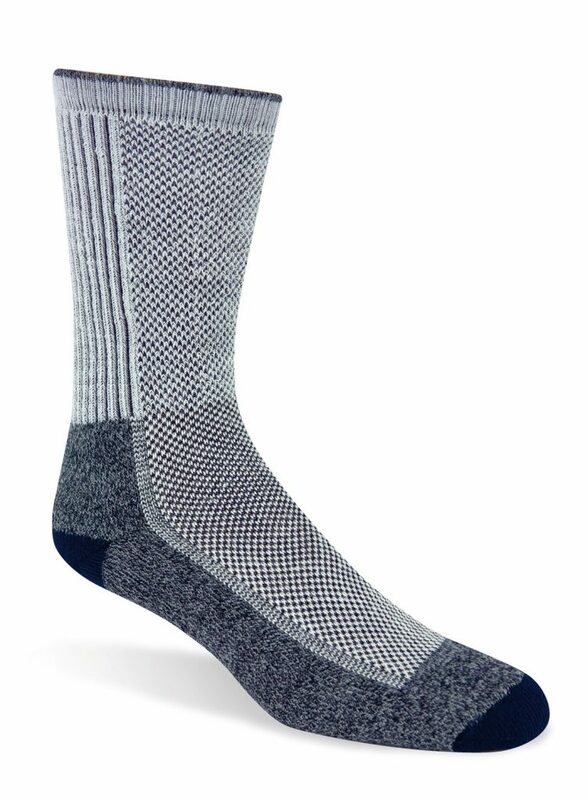 The sock is readily available in either a ‘crew’ version or a ‘quarter’ version and comes in kaki (light brown), navy and a white-grey colour. I find that for the majority of the year I use the quarter length and only go to the crew length as the temperatures get colder to minimise the draft going up the legs of my trousers. I used this sock on the 145 km Canberra Centenary Trail over a three day period in mid summer with temperatures exceeding 35 degrees Celsius and my feet only had minimal sweating on the top. I have worn these socks in winter temperatures of -4 degrees Celsius and have been comfortable (as I said a have a high tolerance to cold). These socks are synthetic and contain no wool which surprised me. 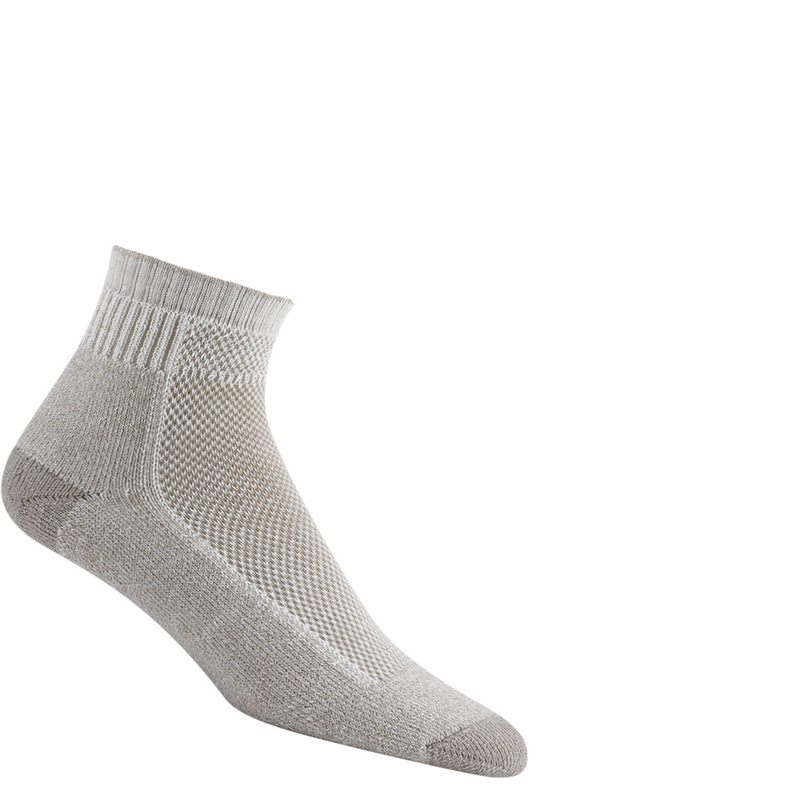 Most synthetic socks tend to feel ‘artificial’ but these don’t. They have a seamless toe which I also find very comfortable. The only real negative with this sock is that while there is a limited amount of compression across the arch area this all but disappears when the sock becomes saturated on creek crossings causing the sock to noticeably loosen. As a result I will either take the socks off before crossing waterways or change socks once I’m sure that I have dry track in front of me. These socks will dry reasonably quickly provided there is a bit of heat in the air but out of preference I will carry three pairs of socks during the colder months to ensure I have a dry pair of socks to put on each day. I have found over the last couple of years that these socks will last me about 300-400 km of hard wet trail conditions and much longer when covering dry trails.